Abha Archives | Untamed Borders - Adventure travel.. Arrive in Jeddah. Transfer to Hotel for a briefing. A full day visiting Jeddah. Visit 19th-century ottoman houses constructed of coral and wood, the most beautiful and well known is Nasif House. Following lunch at a local restaurant, we will drive along the corniche of Jeddah. The road acts as an open-air museum displaying an array of modern sculptures. In the afternoon, we will visit the Altaybat City Museum with its large collection of arts from the Arabian peninsula. Following breakfast we will take a morning flight to Medinah. We shall have lunch and then drive to Al Ula. We shall visit the famous Elephant Rock. In the morning we will visit the old city of Al Ula Mud Village, Mosa Bin Nusair Fort, al Khuraiba and the outside of the Lion Tombs. We will then drive to Taima to visit the Haddaj water well, Al Hamra castle and al Radham. We then continue to Al Jawf. A full day in Al Jawf. In the morning we will visit Domat Al Jandal, also known as Marid Castle. The ancient fortress is 2000 feet high and overlooks the old city from the south. In the city itself, we shall visit Omar’s mosque, names after the second Muslim Caliph: Omar Ibn Al Khatab. We will take a short drive to visit a newly discovered camel carving before moving on to Sakaka Fort, the center of many legends. It is widely believed to have been built in 7th century B.C. with mud construction being added to it in 3rd century. We will end the day with a visit to Sysara water well. In late afternoon there is the opportunity to visit the Olive Festival held annually in the city. Al Jawf is the most important city in Saudi Arabia for the productions of olive oil of the highest quality. The festival takes place over 10 days, with over 150,000 visitors in 2018. The festival centres on the sale of olive oil, olives and olive products but also allow farmers to make deals for future production due to the increasing demand for olive oil. We will start the day with a visit to Al-Rajajil (“the men”) – a site of standing stones aligned to sunrise and sunset. The mysterious stones stand up to 10 feet high and are believed to be over 5,000 years old, complete with Thamudic inscriptions. We will continue to Jubbah where we can see the best and oldest examples of Neolithic rock art, deeply carved into the stone cliff faces. We shall then continue to Ha’il. We will spend the morning visiting Airif Fort, built over 200 years ago as both a stronghold and observation post. Al Qishlah Fort is the largest traditional mud fortress in Ha’il. It is currently closed for development, so we will only be able to visit the outside. Transfer to airport for flight to Riyadh. Morning visit to Dirryyah village. The UNESCO world heritage site is where the history of Al Saud Dynasty began. This will be followed by Masmak fort, one of the most important monuments in the city of Riyadh. The fort was captured by the Saud family in 1902, the start of the Saud family rule of the region. Lunch at local restaurant followed by a visit to the National Museum, composed of eight galleries telling the complete story of Arabian history. Visit Murabba Palace, built in 1937 by King Abdulaziz, in the traditional Najid style using only local building materials. We will then visit the Deira Souq. Finally, late afternoon we will visit the Janadriyah Festival, held annually in Riyadh since 1985. The cultural heritage and folk festival is the largest of its kind in the Gulf. 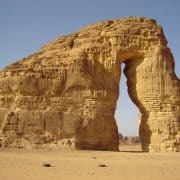 It is divided into sections according to the different provinces of Saudi Arabia. Each province area has their own buildings which are replicas of the architectural style of the region. There are also several marketplaces, art exhibitions, food stalls, stages for traditional dance performances and commercial pavilions. We do not directly arrange international flights to Saudi Arabia. We can suggest routes and operators. We do not arrange Saudi Arabia visas directly. We will provide visa support in the form of letters of invitation to assist in your Saudi Arabia visa application. All meals are included. Bottled water is included. Other drinks are not. When we choose our vehicles and drivers we take into consideration the road conditions, the length of journey and the competence of the man behind the wheel. Your comfort and enjoyment of the journey is the first priority. On this trip, you will be accompanied by a licenced English speaking local guide. This allows for greater security and means that there will always be someone on hand to help or assist you even if the other team leader is busy arranging something. Sometimes we also hire local guides with specialist knowledge of certain areas.